You can never get enough of the Kgalagadi Transfrontier Park. It’s always different, unpredictable, extraordinary and it offers you a premium game viewing experience with its sparse vegetation and concentration of animals in the dry riverbeds of the Auob and Nossob Rivers. There are many reasons to visit the Kgalagadi such as the red dunes, star-filled skies and fabulous sightings of big game like leopards, cheetahs and gemsbok, but visiting to see the enormous Kalahari lions and experience the vast landscape will satisfy your senses. 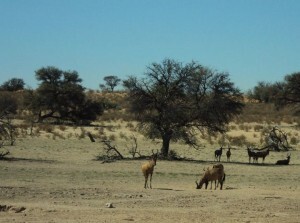 Predators are the Kgalagadi’s biggest attraction. Excellent chances of seeing cheetah, leopard, brown and spotted hyena and the definitive black-maned lion exist. The black-maned Kalahari lions are kings of the Kalahari Desert. Distinguishable from lions in other areas of Africa, these lions have manes of pale gold, longer and leaner legs and large feet; characteristics shared with other species adapted to desert living. Males flaunt manes ranging from blonde to a dark, striking black – for which they are known. Females have lean physiques – designed for endurance – and are strong and stealthy. These lions cover far greater distances than lions anywhere else in Africa due to the low prey densities found in this harsh, arid environment. 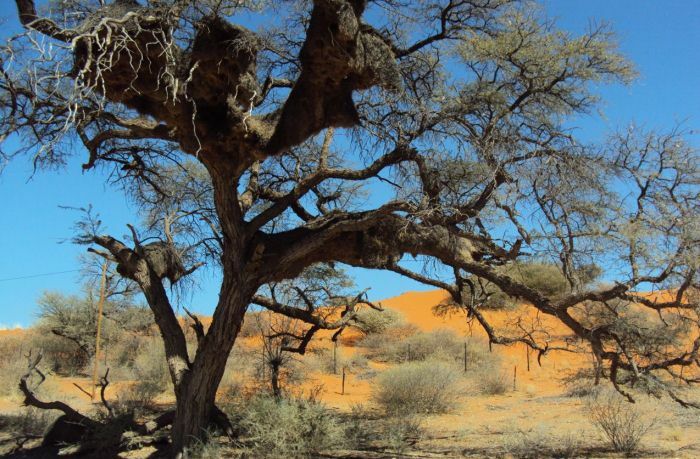 The Kalahari offers no shrubbery or shade except for a few camel thorn trees dispersed through the vast area. Prides that reside here, have far more hardships to overcome than those living in any other area. The Kgalagadi lions have innate cooling mechanisms that initiate the cooling of their blood before it reaches the brain. They protect themselves against the heat and the enormous stretches of aridity with a determined resistance to thirst. In order to maintain their strength, the Kalahari lions rely on frequent, small meals and have been known to prey on anything from common birds to enormous eland. The Kgalagadi is a immense desert of scrub and sand that lies between South Africa, Botswana and Namibia. It comprises one of the largest stretches of sand in the world – it covers 2,5 million square kilometres of southern Africa. It is a desert of endless sands, high dunes and vanishing horizons. Because of the abundant desert grasses, there’s lots of scrub about. The red sand dunes, sparse vegetation and the dry riverbeds of the Nossob and Auob form landscapes that are truly breathtaking. With the uncluttered backdrops, large number of birds and great animal interactions, photo opportunities are awesome. And in the the evening the setting sun colours the dunes from pale pink to glowing orange. The Kgalagadi is truly a semi-desert wilderness of blonde grass, red dunes, enormous peace and space. From the Northern Cape town of Upington, head north to the Kgalagadi Transfrontier Park’s gate at Twee Rivieren. Game drives are offered at the South African side (restcamps). It’s most convenient to have your own vehicle and preferably a vehicle with high ground clearance. In summer, cool, loose clothes. In winter, bring the winter clothing for the evenings. Don’t forget your camera and binoculars. And always bring a hat and sunscreen.